The root of the perennial climber plant Asparagus cochinchinensis (Lour.) Merr. of family Liliaceae. 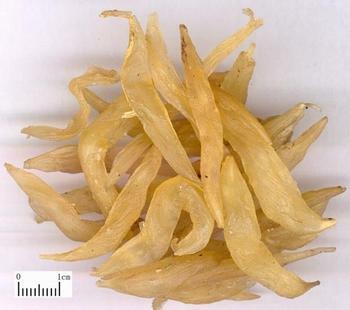 Mainly cultivated in Guizhou, Sichuan and Guangxi provinces in China. Plucked in autumn and winter. Plump, dense, white-yellow and translucent. Sweet, bitter, cold; lung, stomach and kidney meridians entered. Nourish yin of lung and stomach, clear heat of lung and stomach, nourish kidney to clear effulgent fire. It is similar to Mai Dong in actions, both can nourish lung yin, moisten dryness in lung, clear lung heat, and nourish stomach yin, clear stomach heat, produce fluid to relieve thirst and moisten intestines to smooth stool. For dry cough without phlegm due to dryness in lung with heat, thirst, dry stool or constipation due to yin hurt by heat, it is usually combined and Mai Dong in mutual reinforcement, such as Er Dong Gao from Zhang Shi Yi Tong. It is stronger than Mai Dong in fire clearing and dryness moistening because of its bitter and cold properties. It enters kidney meridian with the action of nourishing lung and kidney yin, clearing lung and fire. Therefore, it is indicated for chronic cough due to kidney and lung yin deficiency, blood in phlegm, it is combined with herbs of nourishing yin, moistening lung, relieving cough and stopping bleeding. For instance, it is used with Mai Dong, Sheng Di Huang, Bai Bu and E Jiao in Yue Hua Wan from Yi Xue Xin Wu. It is indicated for bone-steaming and tidal fever due to yin deficiency with effulgent fire, or vertigo, tinnitus, soreness and pain of lumbar and knees, internal heat and consumptive thirst due to kidney yin deficiency, because it can nourish kidney and clear effulgent fire. It should be combined with yin-nourishing, kidney-tonifying and symptom-suiting herbs. For bone-steaming and tidal fever due to yin deficiency with effulgent fire, it is commonly combined with yin-nourishing, deficiency-heat-clearing herbs, such as Sheng Di Huang, Mai Dong, Zhi Mu, and Huang Bai. For vertigo, tinnitus, soreness and limpness of lumbar and knees due to kidney yin deficiency, it is combined with kidney-nourishing, essence-supplementing and bone and tendon-strengthening herbs, such as Shu Di Huang, Du Zhong, and Niu Xi. For internal heat and consumptive thirst due to prolonged kidney yin deficiency, it is combined with herbs of nourishing yin, tonifying kidney, producing fluid and relieving thirst, such as Sheng Di Huang, Shan Yao, and Nv Zhen Zi. It shoutd be used with cautions for cough due to wind-cold invasion and diarrhea due to deficiency cold because of its cold and smooth properties.